Honeysuckle flowers are popular and there is a certain nostalgia associated with this old flower. It's not that surprising then that a quick internet search retrieved over 100 song lyrics that included "honeysuckle," says Michele Weisbrook, University of Illinois Extension Specialist. My drive to work this morning was blessed with an abundance of flowers...and a husband repeatedly asking, "Why do people let this stuff grow?" The stuff (abundance of flowers) is bush honeysuckle. It's beautiful when in bloom and quite fragrant. Just yesterday I watched a young man pick honeysuckle flowers from a small tree and hand them to his girlfriend. It was a sweet gesture. Perhaps my husband is more of a naturalist than a romantic, but his question this morning was still a good one nonetheless. 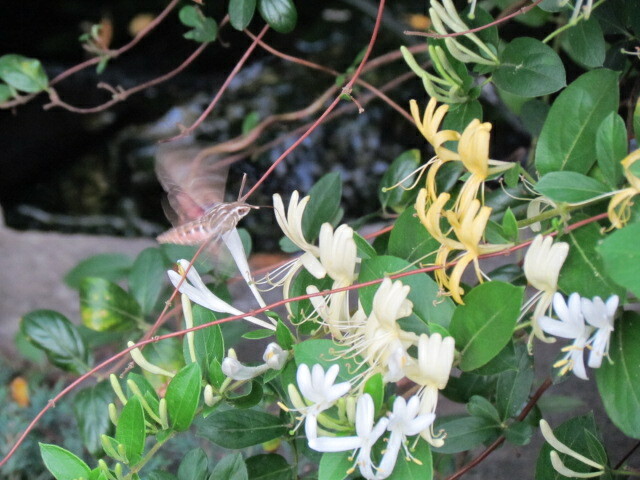 There are about 200 species of honeysuckle and many of which are well behaved ornamentals. Some however are very invasive. The plants along our path were exotic bush honeysuckles. Why were there so many of them being allowed to grow on both public and private property? Perhaps some managers simply can't keep up. Perhaps some homeowners simply do not know the real ecological threat that bush honeysuckles present. Because once you know how easily it can spread and takeover, removing it as soon as possible is best. In fact, the University of Minnesota calls it a "Beautiful Species to Hate." There are quite a few species of exotic bush honeysuckles. Some of the more common ones in Illinois are Lonicera maackii (Amur honeysuckle), L. morrowii (Morrow's honeysuckle) and L. tatarica (Tartarian honeysuckle). They are native to Eurasia and grow as upright, deciduous shrubs (generally 6 to 15 ft.) that flower in the spring. Of course there are native species too which can be easily confused. This is likely part of the problem. Originally grown as ornamentals in the 1800s in the Eastern U.S., they have spread far beyond their original plantings. They can be found in forests edges, thickets, floodplains, roadsides, pastures and the like -- even in urban backyards. They tolerate wetness, dryness, sun and shade. Bush honeysuckle plants commonly choke out native plants in forests. Some studies suggest they are allelopathic even. They have a competitive advantage in that they leaf out very early in the spring and then hold their leaves late into the fall. They can form a dense layer totally shading out native plants below it, ultimately reducing food and cover for wildlife. An abundance of berries are produced that serve as a source of seed for birds. However as a result, the seeds are distributed widely. With bush honeysuckle, vegetative sprouting can also occur. The leaves are egg-shaped and 1 to 2.5 inches long. 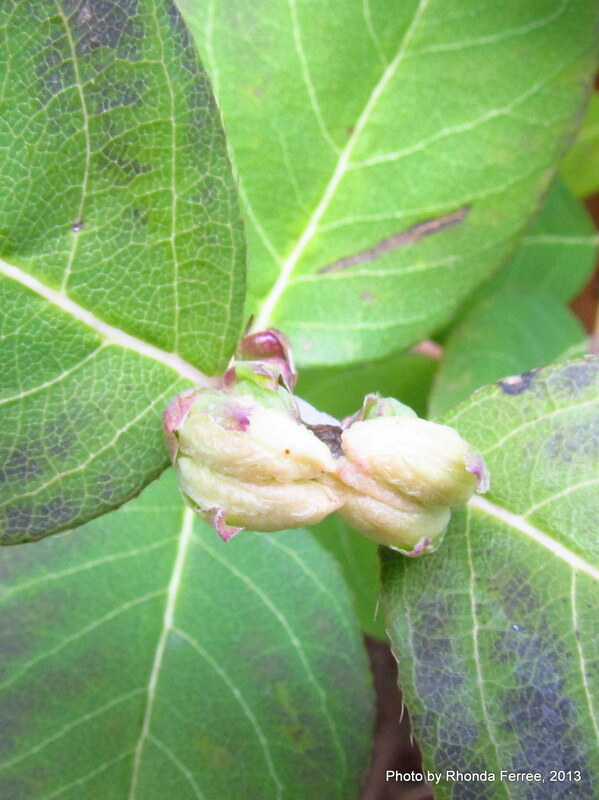 Both the leaves and flowers are in pairs along the stem. The flowers vary from white, to yellow, to pink, to red depending upon the species. These develop into yellow, orange or red berries that contain several seeds. If you are unsure if you have a native or exotic honeysuckle in your landscape, check the stem. For exotics, the older stems are often hollow while most of our native bush honeysuckles have solid stems. In addition, berries and flower characteristics can also be used to differentiate among species. Another telling sign is the quickness of its spread. Exotic bush honeysuckle can overtake your landscape in only a year. Because exotic bush honeysuckles have leaves early and late in the season, they are particularly easy to spot during these times. Seedlings may be hand removed but it's advised that precautions are taken so as to not disturb the soil any more than necessary. This can lead to further seed germination. Plants can be cut back to the ground level. However, plan to cut them repeatedly as plants that are only cut once can form even denser stands. Systemic herbicides such as glyphosate or triclopyr can be used as well. Depending on the product, applications can be made to the leaves, the bark or the cut stump. Please consider potential damage to surrounding sensitive plants when making control decisions. Remember to carefully read and follow all label directions.